I make my own Birthday cake every year, and half the time when I tell people that, they are baffled as to why. I even had someone tell me that it was sad that I made my own, and someone else should make me one or buy me one. But that is not how I feel at all. My boyfriend or family would be happy to buy me one I am sure. I mean, I grew up most of my life with other people making me cakes. But at one point back when I was in college and I started baking a lot, I decided that I loved making my own, because then I could make something fun, something healthier probably than I would get at a bakery, and a cake that was exactly what I wanted. Sometimes it was not cake at all, a few years I made pies because I like those too and that was what I felt like. Even put candles in them and everything. Most years I have an idea of what I want way before hand. Like last year, I made a Vegan Snickers Pie. It was bomb! 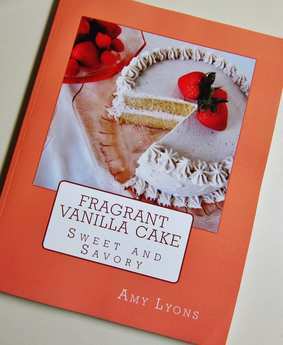 But this year I knew I wanted something with raspberries and vanilla and I went back and forth between cheesecake and a baked vanilla layer cake. I ended up deciding on the cheesecake, because I had a lot going on at the time, and I figured it would be easier to make, plus the heat index was 108F degrees that day and it was super humid, and I did not want to heat up the oven. Also, I always know cheesecakes are going to be good and I hadn't made one in a really long time. 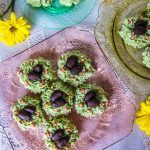 They were my favorite dessert for a while a few years back when I ate only raw foods, and I made one almost every weekend. Now it is usually every few months, and whenever I make one I am reminded of how good they are. Funny story, a raw vegan cheesecake was the reason I decided to go vegan. I made one, and it was so good, that I decided to never make a dairy cheesecake again, and that maybe I didn't need dairy after all. 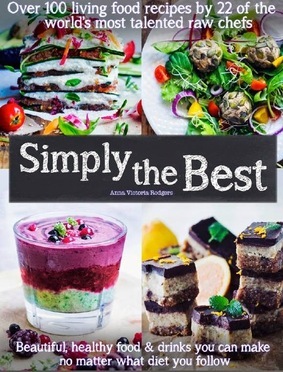 Because that was the main thing that was stopping me from being a vegan, the cheese and dairy products. I became vegan after that and haven't missed animal products. Anyways, back to the cake I made for my Birthday. 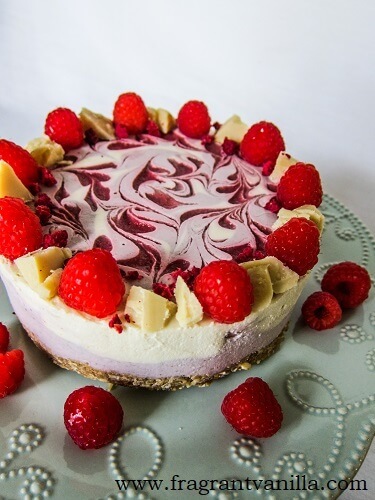 I decided to make a raspberry white chocolate cheesecake. Raspberries are my favorite fruit, and back in the day when I was in school I would joke that if I ever owned my own restaurant I would name it "Raspberry". Yeah, that is not going to happen, but you get the idea, I really love raspberries. I had plenty of cacao butter on hand, so a raspberry white chocolate cake was the perfect thing to make! 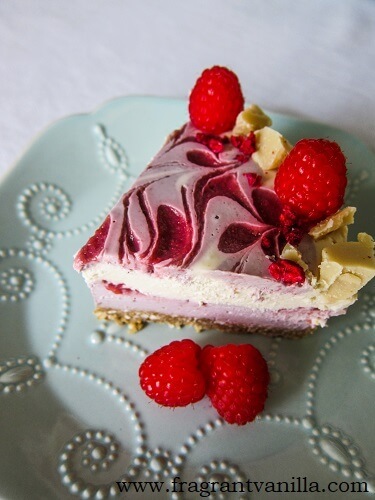 It is really quite simple to make a raw cheesecake too, don't let this one fool you. I made a raspberry filling and a vanilla filling, both containing the cacao butter for white chocolate, as well as a raspberry swirl. It turned out exactly how I wanted it! 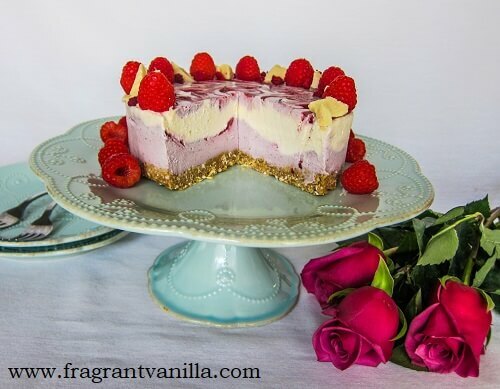 So rich and delicious, creamy like dairy cheesecake, and scented with sweet raspberries, vanilla and white chocolate. 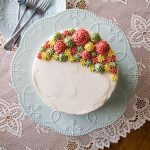 This is the perfect cake for Summer! So, if you have raspberries on hand, give it a try! 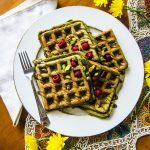 Meanwhile, to make the filling, combine the coconut milk, cashew butter, maple syrup, lemon juice and zest, vanilla and sea salt in a high speed blender or food processor and blend until smooth. Add 1/2 cup of the coconut butter and cacao butter and process until smooth. Divide the filling between 2 bowls. Add one bowl of filling back to the food processor and add 1 cup of raspberries and 2 Tbsp coconut butter and process until smooth. Pour back into the bowl and set aside. Rinse out the food processor and puree the other 1/2 cup of raspberries until a loose jam consistency. 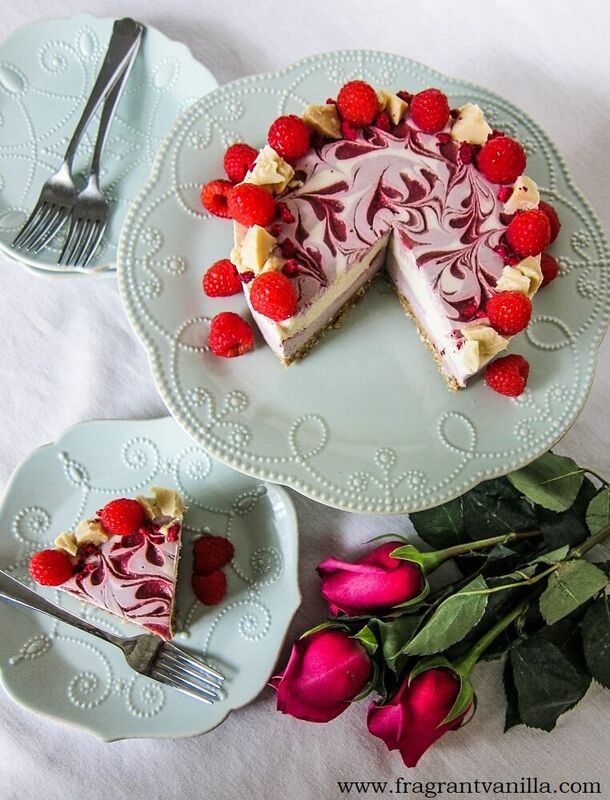 To assemble the cake, Pour all but about 1/4 cup of the raspberry cheesecake filling over the crust, then drop some of the raspberry puree over that by the tsp, and swirl with a knife. Then pour the vanilla filling over that, and drop the raspberry filling and raspberry jam over that by the tsp (you may have extra, but don't add it if you have enough already on top of the cake or it will look messy) swirling it with a knife to make the top pretty. Place cheesecake in the freezer to set for about 4-5 hours (or overnight in the refrigerator if you are not in a hurry). Remove from the freezer, un-mold, and enjoy! Store any leftover cake in the refrigerator. *I use Thai Kitchen full fat coconut milk. If you are using a different brand, just make sure it is the thick type, 2/3 of the can at least should be very thick. Apparently I won't be making ice cream for my birthday this weekend after all but cheesecake, raspberry cheesecake. Happy Birthday! Thank you! Cheesecake is so much better than ice cream ;). Happy Birthday :)! Oh my goodness gracious gosh! I never did get to make this for my birthday but I did it today with some home made tart cranberry sauce. It is amazingly silky and delicious. I'll definitely have to make it again with some fresh raspberries. Happy Thanksgiving. I am so happy to hear that you enjoyed it :)! Happy Thanksgiving to you too! Oh my goodness, this is STUNNING! 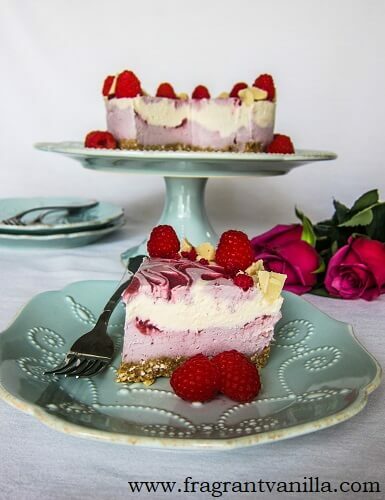 I adore the white chocolate and raspberry combination, and I promise this recipe is going to be put to good use in my kitchen ASAP. I just got a new jar of coconut butter without any particular plan, too, so it's clearly a sign.